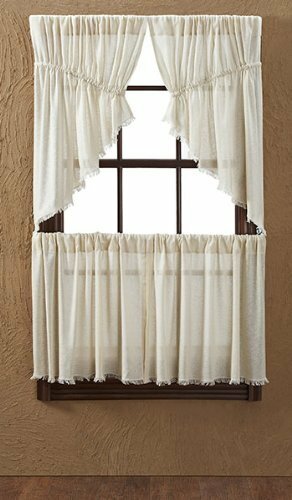 The Tobacco Cloth Antique White* Panel Fringed Set of 2 84x40 brings a luxuriously upscale farmhouse look to your home or retreat. 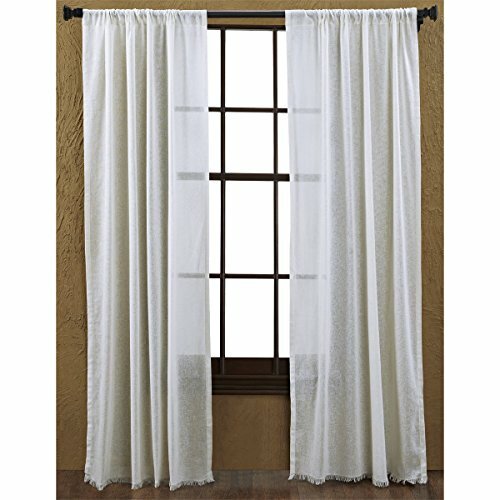 A lightweight antique white* tobacco cloth drapes your window in sheer elegance with its soft and simple texture.FEATURESLightweight antique white* tobacco cloth fabricTobacco cloth offers simple textureFringed edgeIncludes 2 matching tie-backsSingle fabric: Machine stitchedSPECIFICATIONSDimensions: L84"xW40"Weight: 1.8 lbMaterial: 100% cottonComponents: 2 panels with matching tie backsHeader: 3.25" rod pocketManufacturer Country: IndiaCare: Hand wash separately in cold water. Do not wring. Lay flat to dry, out of direct sunlight. No chlorine bleach. Do not iron or tumble dry.COLORS AVAILABLE - Specific Color:Natural - cremeKhaki - dark tanAntique White - antique white* The description above varies by selected color. Please reference images and specific colors for clarification. ** Due to the unique nature of the fabric, the product will crinkle slightly when washed. Fabric will shrink when laundered. Product is made larger than printed to allow for this shrinkage. We do not guarantee that items will shrink at the same rate. 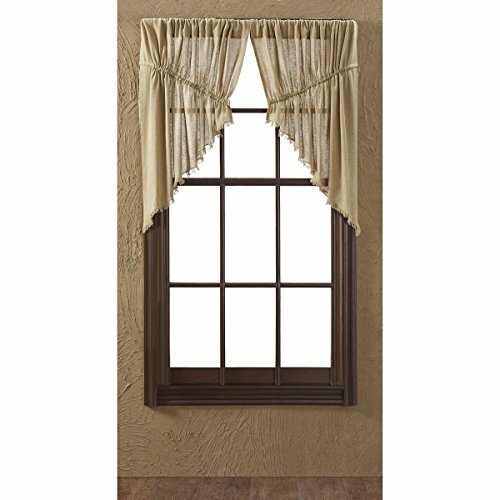 The Tobacco Cloth Khaki Prairie Swag Fringed Set brings a luxuriously upscale farmhouse look to your home or retreat. 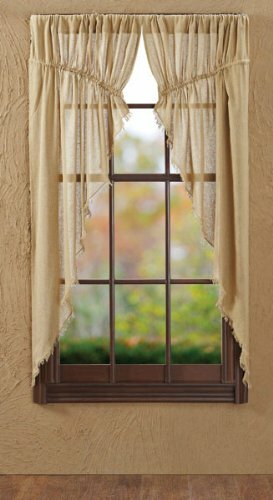 A lightweight dark tan tobacco cloth drapes your window in sheer elegance with its soft and simple texture.FEATURESLightweight dark tan tobacco cloth fabricTobacco cloth offers simple textureFringed edgeDrawstring tiesSingle fabric: Machine stitchedSPECIFICATIONSDimensions: L36"xW36" with an 18" center dropWeight: .6 lbMaterial: 100% cottonComponents: 2 mirror image drawstring panelsHeader: 3.25" rod pocketManufacturer Country: IndiaCare: Hand wash separately in cold water. Do not wring. Lay flat to dry, out of direct sunlight. No chlorine bleach. Do not iron or tumble dry.COLORS AVAILABLE - Specific Color:Natural - cremeKhaki - dark tanAntique White - antique white* The description above varies by selected color. Please reference images and specific colors for clarification. ** Due to the unique nature of the fabric, the product will crinkle slightly when washed. Fabric will shrink when laundered. Product is made larger than printed to allow for this shrinkage. We do not guarantee that items will shrink at the same rate. Features : Single fabric , Machine stitched , Lightweight khaki tobacco cloth fabric , Fringed edge , Features 3.25" rod pocket SPECIFICATIONS , Set includes 2 tiers , Dimensions (Each): L36xW36 (in) , Approximate Weight: 0.7 (lb) , Material: 100% Cotton , Made in India Care: Hand wash separately in cold water , Do not wring , Lay flat to dry, out of direct sunlight , No chlorine bleach , Do not iron or tumble dry. Our Tobacco Cloth Collection is inspired by historically accurate samples, traditionally used to cover the tobacco plant. 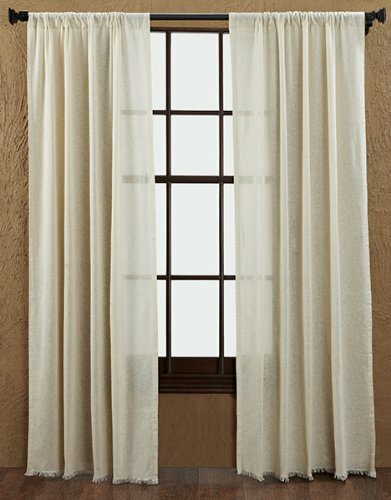 Our unlined collection, available in 5 colors, is light and airy (similar to cheesecloth) and works well with all decor. 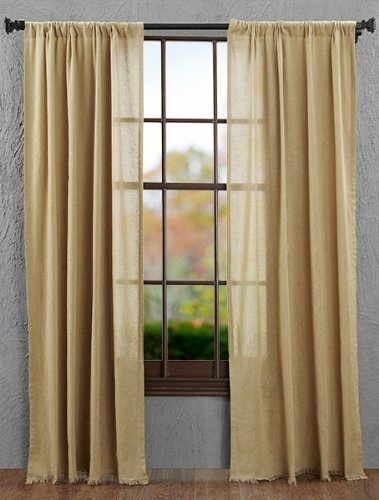 Features : Single fabric , Machine stitched , Lightweight natural shade tobacco cloth fabric , Fringed edge , Features 3.25" rod pocket SPECIFICATIONS , Dimensions: L16xW90 (in) , Approximate Weight: 0.6 (lb) , Material: 100% Cotton , Made in India Care: Hand wash separately in cold water , Do not wring , Lay flat to dry, out of direct sunlight , No chlorine bleach , Do not iron or tumble dry. 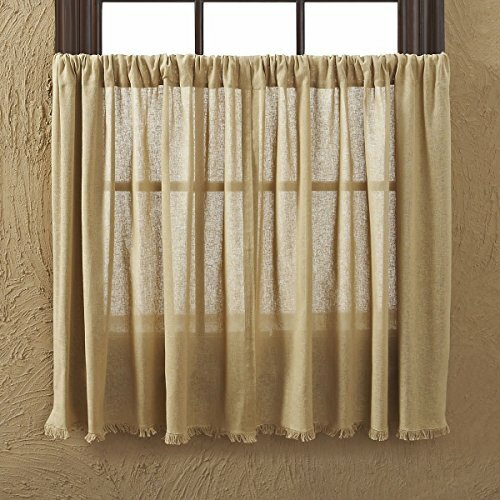 Looking for more Tobacco Curtain Panel similar ideas? Try to explore these searches: Adjustable Bracket, Graphic Womens Soccer T-Shirt, and Crystal Pump Deodorant. 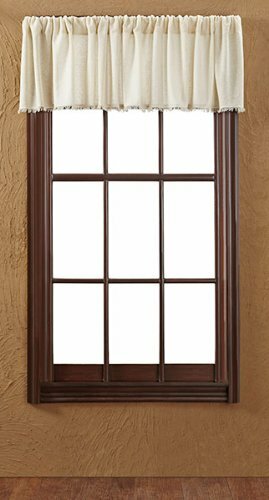 Look at latest related video about Tobacco Curtain Panel. Shopwizion.com is the smartest way for online shopping: compare prices of leading online shops for best deals around the web. 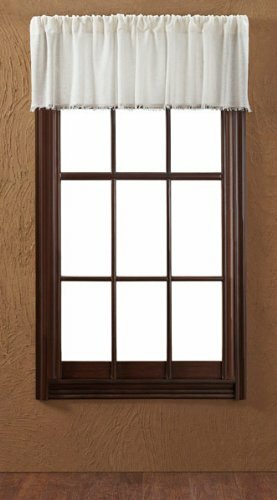 Don't miss TOP Tobacco Curtain Panel deals, updated daily.